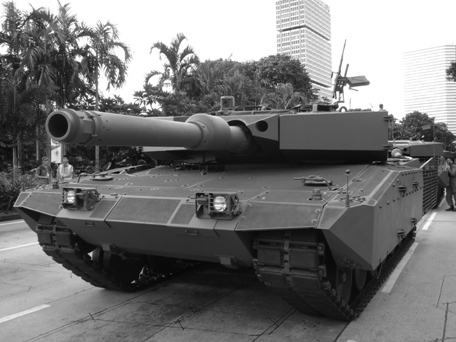 Truth by Kbaig: Two Ex GOC's of 1-ARMD. Division! America "Kind to One, Enemy of Other"
Two Ex GOC's of 1-ARMD. Division! America "Kind to One, Enemy of Other"
Any person whether leader of a group or army, his sacrifices for country or nation, services, loyalty and positive or negative role he played is better decided by future historian. However what people of his time think about him or public opinion about him is of much importance as well. Because the personality and beliefs of the person are open to everyone. Today’s topic is about such like two personalities, just with one difference that superpower USA is kind over one while enemy of other. But coincidence is that both belong to armed core of Pakistan and both have been lucky enough to command 1-Armed Division (lucky because the command of 1-Armed Division is dream of every cavalry officer of Pak-Army but much difficult) and both are important topic of discussion on international level. Whether it is Mehmood Ali Durrani or Hameed Gul both does not need any introduction. But look at the luck Durrani is famous as “General Shanti” (this title is given to him by India and has become his identity over European websites), while against Hameed Gul USA has forwarded application to UNO to declare him as terrorist and for his arrest. Just because this Pakistani is not ready to become slave of US. Another important difference between these two is that in spite of American threat of declaring him as terrorist from UN and knowing its result Hameed Gul is criticizing USA, Israel, and India as he used to do before retirement. In contrast to him Mehmood Durrani is issuing explanations after accepting Ajmal Qasab as a Pakistani citizen or sometimes he is observed sad over being expelled from Advisory of National Security. Major General Mehmood Ali Durrani was absent from the scenario for last two decades. But when in June 2006 the reports were heard that he is being sent to US as Pakistani Ambassador Nation did not give it much importance. Because on the political scenario, a tussle was going on between supporters and opponents of Pervaiz Musharraf. 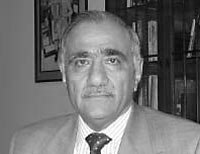 But when in May 2008 he returned back to Pakistan as advisor for defense to Prime Minister, then public realized that he will do something for American interests hurting credibility of Pakistan. Look at the newspapers of last six months you will get the idea that groups were expressing concerns about General Durrani’s links with US. All these concerns proved true when suddenly General Durrani accepted Ajmal Qasab as a Pakistani citizen. This confession was not less then an earthquake for nation, it provided India moral and diplomatic superiority over Pakistan. Public was shocked when Prime Minister expelled General Durrani from advisory but it was of no use and much late. General defended himself by saying that in this way the tension between the both countries will decrease, but India openly threatened to attack Pakistan. This situation refreshed the wounds of martyrdom of General Zia-ul-Haq and other officers of Pakistan army. A wave of protest raised against General Durrani and discussion started about his role in the crash of C-130 which departure from Bahawalpur on 17th August 1988. As a reaction to this General Durrani gave a long interview to a newspaper. In this he tried to defend himself about acceptance of Ajmal Qasab as a Pakistani citizen and told that he did so, on the will of President. Defending himself in the plane crash of General Zia he said, “I did not invite Zia-ul-Haq to attend the excercises of M1-A1 Abraham Tanks”. However he accepted that the gift of mango crates was given General Zia as a tradition of Southern Punjab. Moreover he threatened that hew will go to court against those accusing him for conspiracy of C-130’s destruction. During his interview he no where mentioned that this incident should be reinvestigated so that real culprits can be brought forward and it can be proved that he is not involved in it. In spite of no investigations conducted the news and pictures have been published showing that a hole had been made in the cargo door of C-130 as it was hit by a missile fired from ground and it caught before hitting the ground. However the destruction of C-130 is not our today’s topic. But General Durrani’s statement that India has not provided any evidence but just information about Mumbai attacks is not less then a joke and worries of US and India for him are not baseless. Now let’s come towards General Hameed Gul. Although due to tension between India and Pakistan our free electronic media has not given any importance to the plans of Americans and Jews against General Hameed Gul. But on the international level discussions are going on it. According to some, investigations from UNO on the Benazir tragedy and application against General Hameed Gul are the links of same chain. So that if UN hesitates to declare him as terrorist or any protests are held in Pakistan against any such declaration then Hameed Gul could be involved in Benazir murder case. International analysts claim the new FIR of Karsaz tragedy is a past of this mission in which along with General Hameed Gul Ex-Chief Minister of Punjab Chouhdary Pervaiz Ellahi has been also nominated. According to some analysts the reason behind American enmity towards General Hameed Gul is poor situation in Afghanistan. Because after establishment of Taliban (for which America had spent millions of dollars) and before they were used to secure US interests, America had to face defeat. Taliban left the US policy of securing “Trade Route” from Qandhar to Central Asian States and started struggle to establish Islamic State. 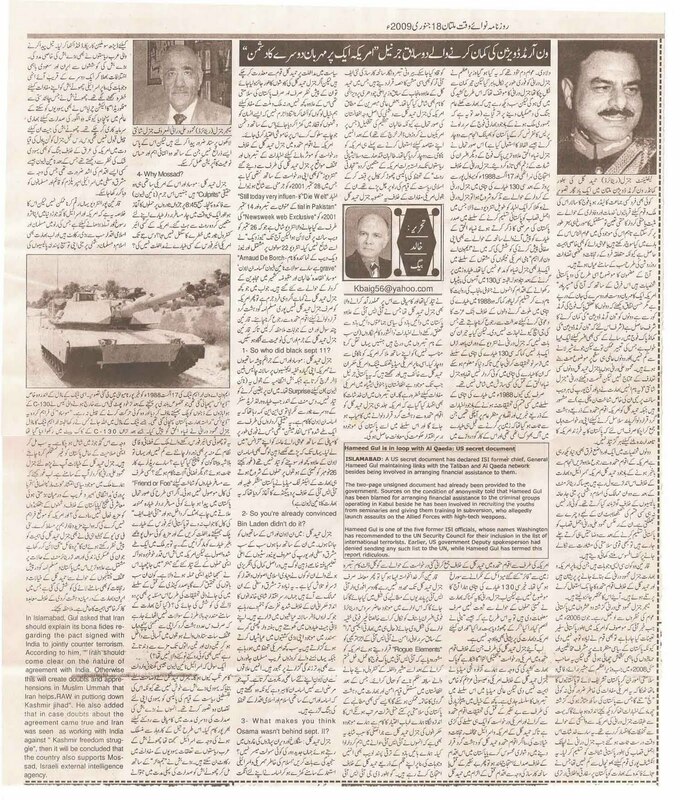 According to US this plan against American interests was prepared by General Hameed Gul and he successfully fulfilled his plan with the support of Pak-Army, ISI, some political parties, newspapers, intellectuals and columnists and derailed American plan. Due to this US media, think-tanks, and rulers are afraid of General Hameed Gul and think that as long as he is present the threat American interests in Afghanistan and South Asia will be there. In these analysis concerns have been expressed that US will soon succeed in declaring General Hameed Gul as terrorist and it has support of govt. of Pakistan as well. $40 billion a year on its 11 intelligence agencies. intelligent people from thinking for themselves. millions of poor people are seeking human dignity. they are defending Islam and its values. for such a sophisticated operation. IFF -- friend or foe identification -- challenge. 43 was a potential danger to Israel. You can see the rest of Interview here! The summary of this interview is that the cooperation between Israel and America is for increasing their influence and securing their control over the whole world. Muslims and Islamic values are the biggest hurdle in their way. Now India has also joined this cooperation due to its imperialistic agenda and enmity against Islam and Muslims. They all want to disintegrate nuclear power Pakistan. 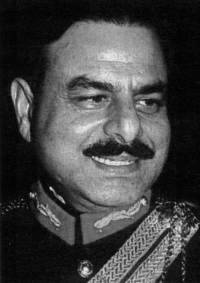 You have read the point of view of General Hameed Gul, the role of General Mehmood Ali Durrani is also in front of you. Now yourself think over the increasing political chaos, corruption, injustice, poor administration, increasing gap between rich and poor, will not all these factors strengthen conspiracies against Pakistan? Will not this situation provide another chance to US to use more of its agents to control us? Keeping in mind the importance of General Hameed Gul BBC, U.K, and W.E.B has stored his profile online which consists of his professional and after retirement life. In this profile they have tried to bring forward his thinkings about different challenges that are being faced by Muslim Ummah and especially by Pakistan. The discussion about Iran-India deal against terrorism is also included and of much importance. “In Islamabad, Gul asked that Iran should explain its bona fides regarding the pact signed with India to jointly counter terrorism. According to him, “Iran should come clear on the nature of agreement with India. Otherwise this will create doubts and apprehensions in Muslim Ummah that Iran helps RAW in putting down Kashmir Jihad.” He also added that in case doubts about the agreement came true and Iran was seen working with India against “Kashmir freedom struggle”, then it will be concluded that the country also supports MOSSAD and Israeli external intelligence agency”.